– Ahoy there – The ‘Trekaway’ – The last boat to enter Fred Crowell’s yard before his retirement. – Soundings – restoration progress: Lifeboat – Henry Frederick Swan, Foy Boat Joan. – Maritime Tales – Anstruther Trip. – Soundings – restoration progress: Lifeboat – Henry Frederick Swan, Foy Boat Joan, Wren, Miss Rosie and Stuart Turner Engine. – Maritime Tales – Memories of Rachel Douglas. 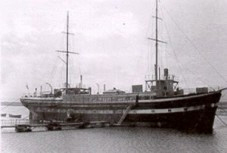 A PROJECT to conserve historic north east maritime vessels has received a “kick start” after winning vital grant aid. John Robinson Stops the Leaks! Roofing contractor John Robinson has done a splendid job repairing the leaking roof of the workshops – and it has not cost the Trust a penny. He has removed loose sheeting and overlaid the felted timber roof over all of the old timber built workshop, making it secure and water tight, enabling work to go ahead underneath without hindrance. The repairs have also saved us the worry of potential rot of the roof’s timber structure, which had been at risk. Many thanks to John for his exceptional support. Additional help was also given, by way of scaffolding, to enable the NEMT sign to be fitted above the work shop door. Hopefully, we can now be easily identified from the river and beyond!! The terrible fire that has ravaged the Cutty Sark has had at least one positive outcome – people in high places have now recognised the significance of the only other clipper of its type, City of Adelaide. Permission has already been given for the destruction of the Adelaide; they are trying to put a positive spin on it by euphemistically calling it a deconstruction. 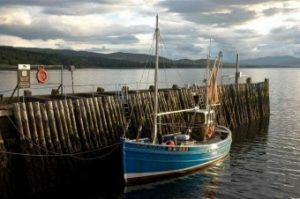 The restored seine / ring netter Rachel Douglas has now commenced a summer tour of Scotland, crewed by members of the Friends. The boat has just visited the Portsoy Scottish Traditional Boat Festival where she created a lot of interest. The organisers have asked for a return next year and a request has been obtained from people at Wick for a visit of the vessel in 2008 as well. Rachel is now sitting at a berth in Inverness prior to the NEMT crew taking her to the Crinan Classics Festival at the end of July. The vessel should be familiar to members as the blue former fishing vessel that has visited previous NEMT events at South Shields. She is normally berthed at St Peter’s Marina in Newcastle, together with the restored Favourite. 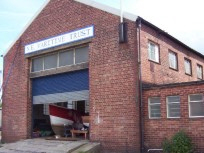 The protection and finance of both vessels are undertaken by our associates, the Northumbrian Fishing Heritage Trust. completing the first leg of the Summer Tour. NEMT has been allocated a space for a stall at the Customs House . This will be an important opportunity to promote the Trust and every effort should be made to ensure the event is a success. The Wapping St. workshops will also be open to visitors during both days. Artist, Ron Curran will be exhibiting his work of Water Colours of the Tyne along with additional works by Friends of the Trust. Light refreshments to be available. We desperately need volunteers to help prepare and man both the Stall and Workshops for the event. A spectacular sight of over 70ft long with her large red Lug sails, the Reaper had completed a six-month refit before returning to Anstruther, Fife in April 2005. 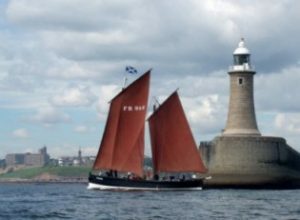 Also on the river will be several Sailing Cobles and many boats from local clubs and associations including the Coble and Keelboat Society who are all invited to join the flotilla and parade of sail. All hands to the jacks! And She is now raised up 1Metre from the ground. Thanks goes to the Tyne Harbour Master Mike Nicholson and Doug Dunn at Tyne Dock for supplying the wooden keel blocks. The majority of the Anti Fouling is now off and the initial findings are very encouraging. However, there is still a lot of basic time- taking preparation to be done and extra pairs of hands are always made extremely welcome. The lads meet at the workshops on every Wednesday from 09.00 to 15.30. We would like to be open to the public and continue work on the HFS on additional days. However, Wednesday is obviously not convenient for everyone. Is there anyone out there (male or female) willing to open up on another day even if it is just for the morning or afternoon?